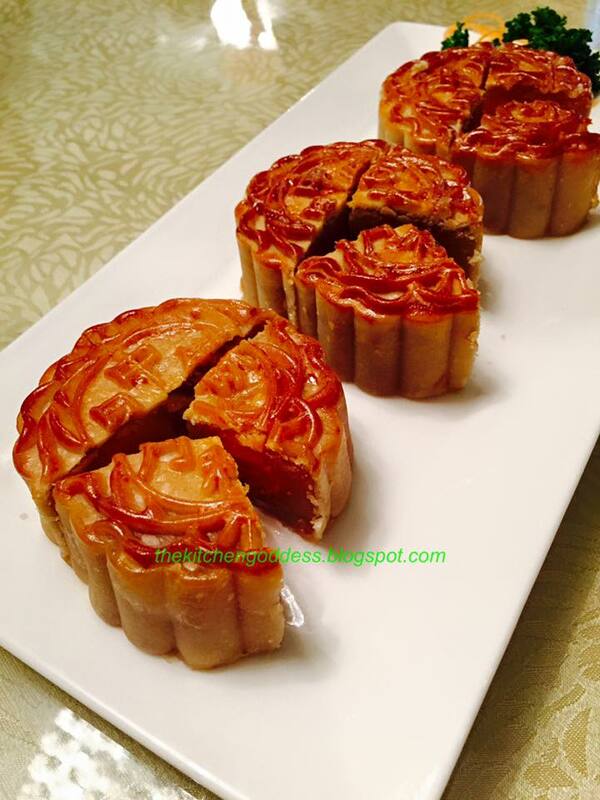 Mid-Autumn Festival used to be a harvest festival in China but through the years, it has evolved into a much more happy gathering of family and friends, not only to feast but also to play the much beloved Dice Game or Pua Tiong Chiu. This is my first time to join the Crystal Jade Dining IN Mid-Autumn celebration because I wasn't able to attend last year. So I'm excited because I know that the restaurant created a special set of menu for this celebration until the end of September. This is the special set menu prepared for us. Its good for 8-10 pax. Roasted Peking Duck. A whole serving of mouthwatering duck. Look at that skin! So shiny and inviting. I can visualize myself biting into the rich and crispy skin. Alas, I may have to wait for a few minutes until the duck is carved and wrapped in think pancakes. 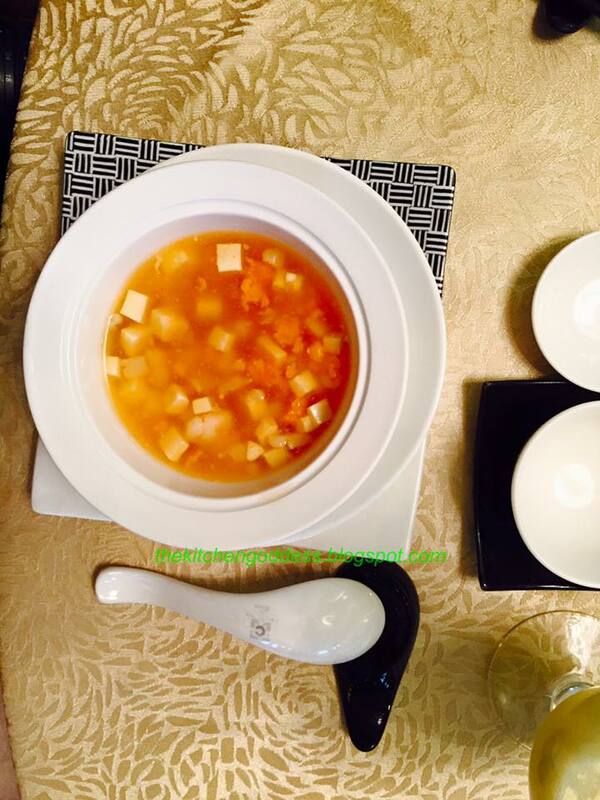 So while waiting for the Peking Duck, we were served Braised Fresh Scallop with Shrimp Soup. A sweet and tangy soup that is bursting with the goodness of the sea. I love how you can actually chew the scallop and shrimp and not just taste it. There are bits of soft tofu also. 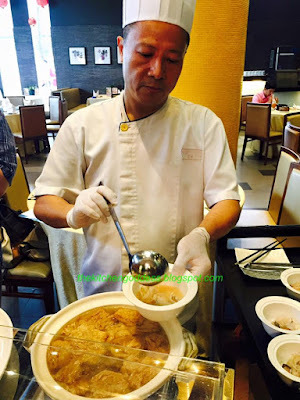 Here is what's happening to the Peking Duck while we're busy with the soup --- click Peking Duck is you want to watch the video. 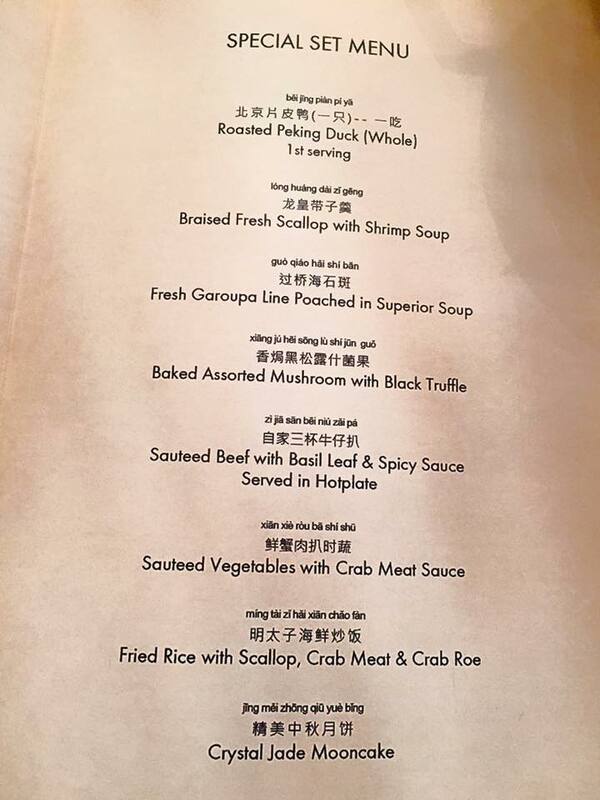 Here's the next course --- Fresh Garoupa Line Poached in Superior Soup. Wow, I haven't had garoupa (lapu lapu) for ages. I mean, its hard to buy fresh lapu lapu. 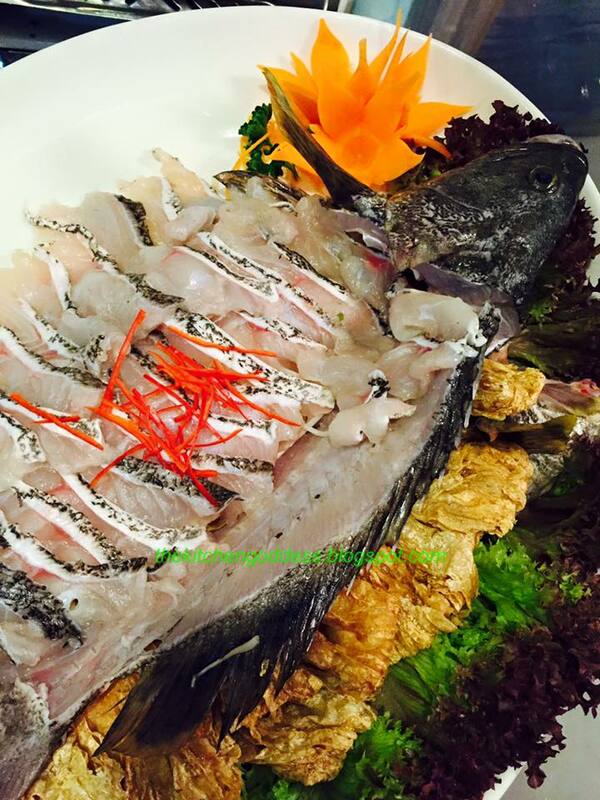 See the color and texture of the fish? The meat should be firm, pinkish and shiny. Here's Chef preparing the Garoupa Soup. You can watch the video here. 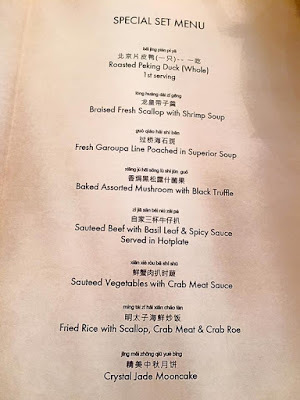 We were served Baked Assorted Mushrooms with Black Truffle while waiting for the Garoupa Soup. And its kinda hard not to be excited because the soup smells so delicious. Anyways, these mushroom pouches looks interesting. When I first saw the tray with the mushroom pouches, I thought that they'll pour in some soup but it was served as it is. I espied some shitake and button mushrooms. Yum! 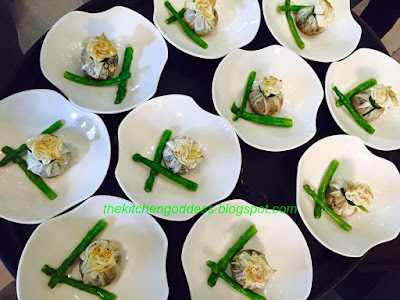 The mushrooms are cooked in a special sauce and placed in wafer thin wrappers then baked. It comes with asparagus. What's remarkable here is the rich flavor of assorted mushrooms and the plain baked wrapper goes well together. And here's the Fresh Garoupa Line Poached in Superior Soup. The brown one on top are slices of dried tofu. It comes with three choices of sauce (sorry no photo)- XO, chili sauce, and another one that I can't remember. I mean, I didn't waste time savoring the soup. Two thumbs up! 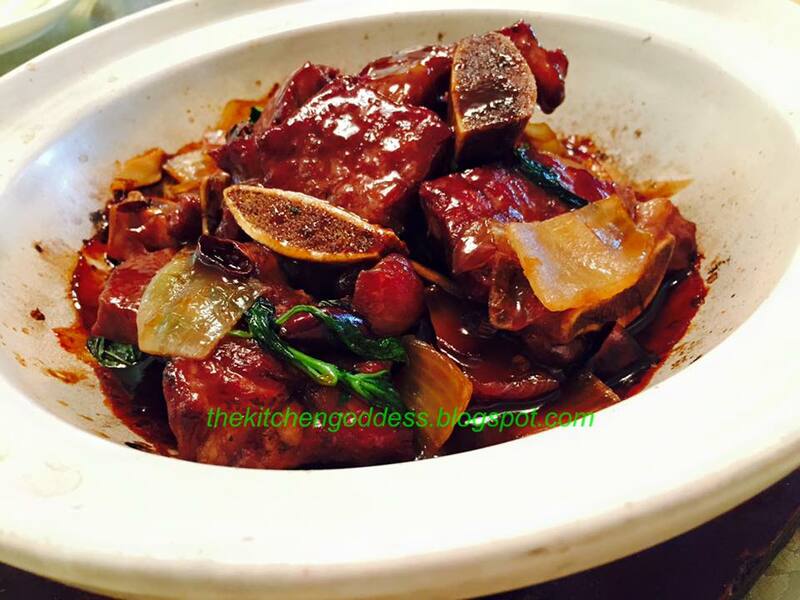 By the way, I forgot to mention that this is a new and special dish offering by Crystal Jade Dining IN for the month of September. If you think the meal has ended, then you're wrong. 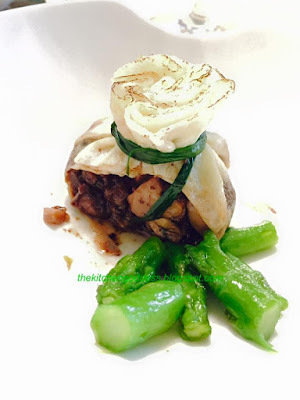 This steaming Sauteed Beef with Basil Leaf & Spicy Sauce landed on our table. Wait, here's another dish --- Sauteed Vegetables with Crab Meat Sauce. 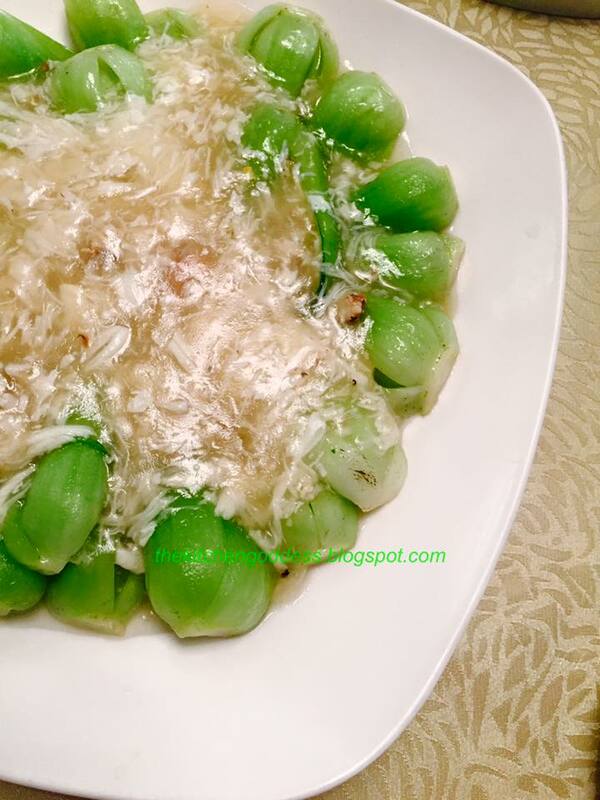 I love the crab meat sauce with the bokchoy. A very light but filling dish. And here's the Fried Rice with Scallop, Shrimp, Crab Meat & Crab Roe. OMG, the fried rice looks so delish and the aroma is heavenly I almost gave in to temptation. 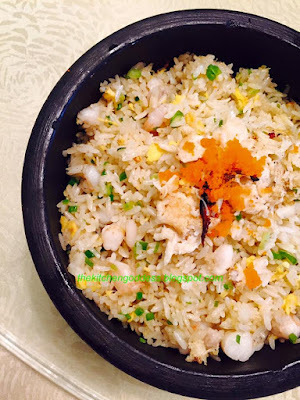 But I know that its good simply by just looking at it- it has a generous amount of scallop, shrimp, crab meat and other ingredients. Yum! Please visit The Kitchen Goddess FB Page for the Set Menu choices this September. Those look so delicious! 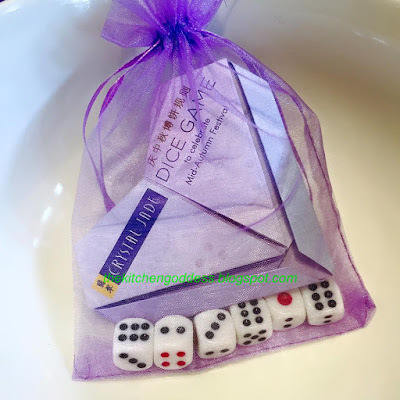 I cannot wait to play dice game with my family and friends. Chinese banquets can really make us fat with all those many yummy dishes! :) So excited for dice game! 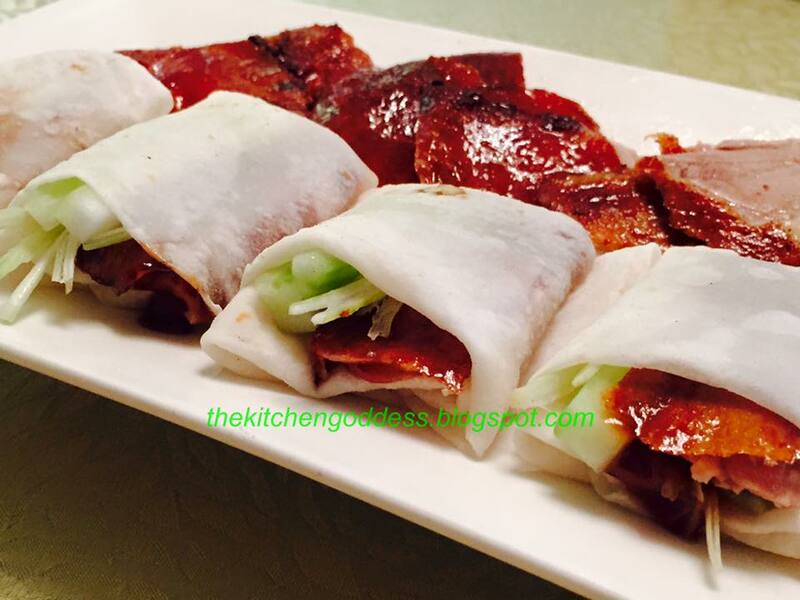 I love the color of their Roasted Peking Duck, also the other recipes looks so yummy! 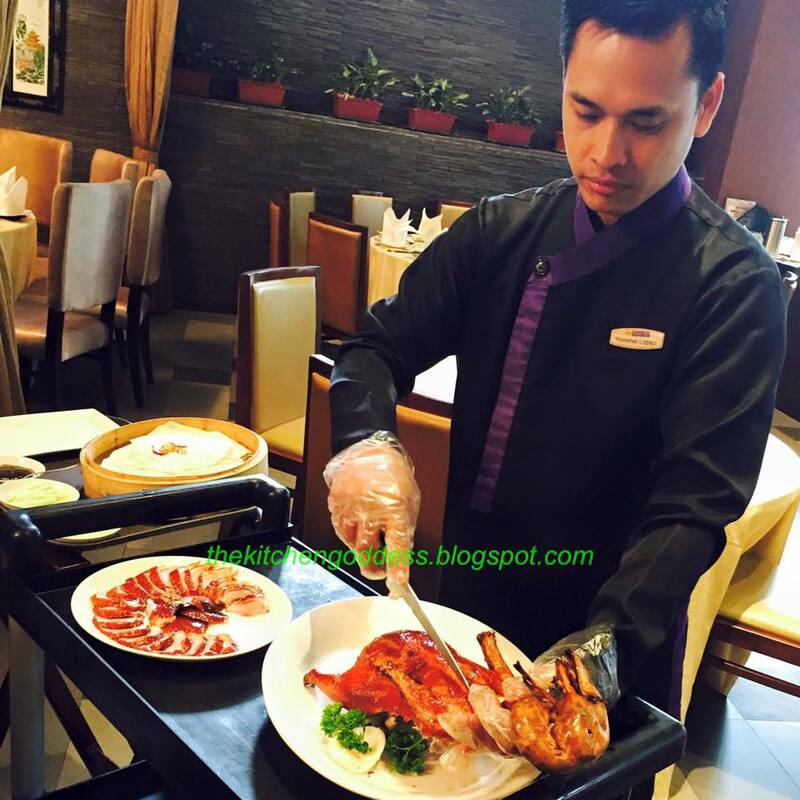 The roasted peking duck! Yum! The presentation looks great! The peking duck must be cooked very well to eliminate unwanted after taste. =) I hope this one doesn't have an after taste. =) It looks really good. Oh my! The pecking duck looks so so yummy! Oh my goodness Chinese food is lalala-love! 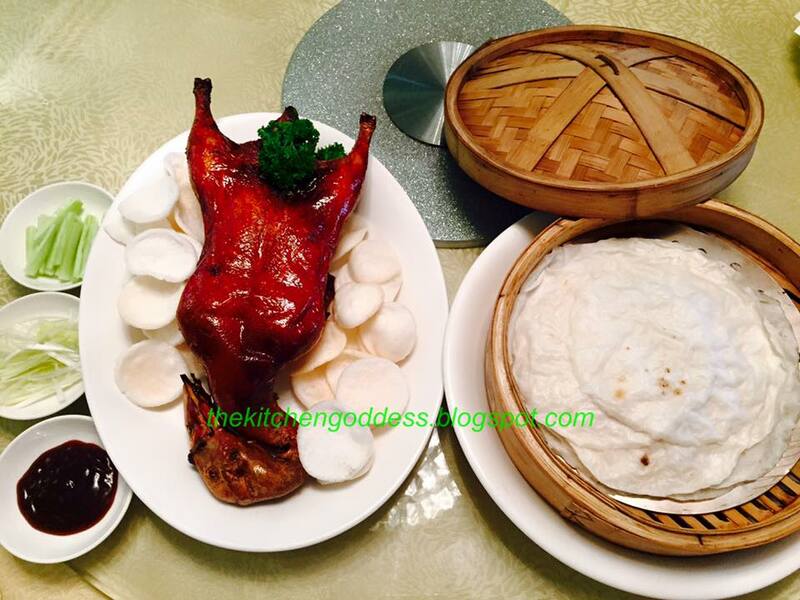 I want to dig into that Peking duck! 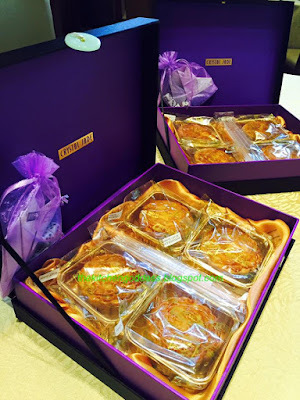 I'm curious about their mooncake! 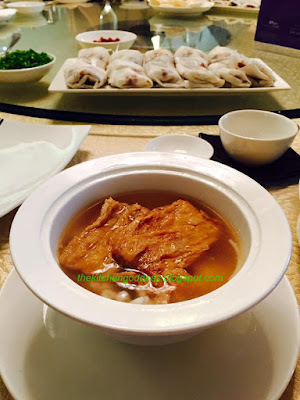 Being born in a Chinese family, I've had my share of Chinese food at home and from all sorts of restaurants. That's why I tend not to choose Chinese food anymore these days when we go out. Haha! But I gotta admit I do miss eating Peking Duck. The food here looks great! Wow! They look so yummy! I love mooncake festival here at work. Dami prizes.